No question about it – this is the best way to use leftover ingredients; open the refrigerator and see what you have, and begin! NO RULES! 1/2 cup shredded cheddar or Monterey Jack – or both or whatever you have! or, anything else you find* – substitute for any of the above. Beat the eggs together with the S&P, do not overbeat just until the eggs “come together”. Stir in the cheeses and hot sauce, set aside. In a large oven-proof, non-stick skillet (a large omelet pan is best) melt the butter over medium-high heat. Add the onions and any other fresh veggies you are using, until soft. Add the diced potato, S&P, saute a little with the veggies for a couple of minutes. Add the kale or spinach, stir to cook one minute. Finally, add the roasted red peppers and olives if using and stir until everything is HOT. Do not turn the burner off yet. Now, be sure all of the items in step 4 are spread evenly over the bottom of the skillet, you are ready to slowly pour in the egg mixture so that it evenly coats every item. Let it sit on the burner for 35-45 seconds to allow the edges to “set.” Put the skillet in the preheated oven. 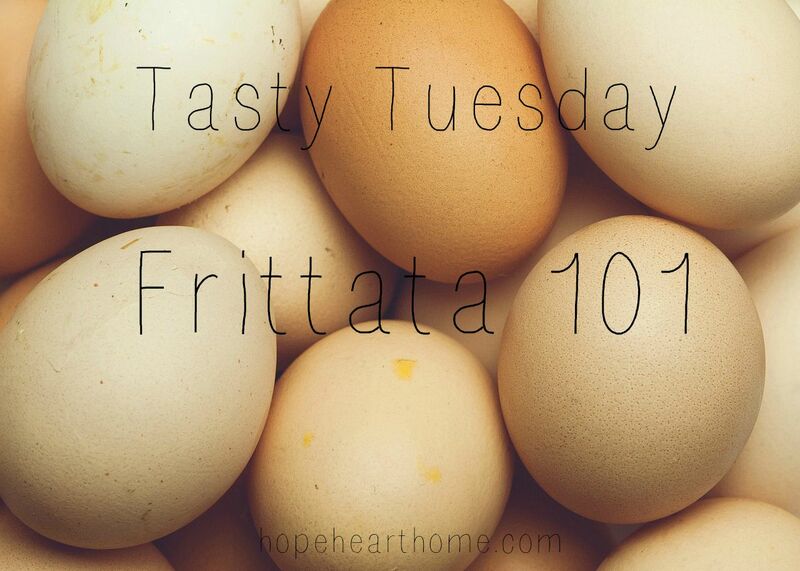 Watch the Frittata as it cooks – let it cook in the oven for 10-12 minutes until the eggs are set but remove it before the eggs brown too much on the top. Slide the Frittata out of skillet onto a large cutting surface. Using a long serrated knife, slice it into wedges. Serve warm with fruit or a salad and toast? *Ingredient ideas: mushrooms, leeks, tomatoes (even sun-roasted), zucchini, squash, bell peppers, bacon, ham, beef chips – anything goes! Write 31 Days begins October 1 – Tasty Tuesday posts will be discontinued until November 3rd, 2015! I love brinner (breakfast for dinner!) I might have to try this. Hard to believe we are only two days way from October and Write 31 Days! Sounds absolutely delicious! I see frittatas being made on Food Network (LOL), but, have never tried doing it. Sounds pretty straight-forward! Thanks.